Профессор, Токийский столичный университет (Токио, Япония). В. А. (бакалавр гуманитарных наук): апрель, 1995 г. Факультет торгововедения. Палеолитические адаптации охотников-собирателей в Евразии; четвертичное исчезновение мегафауны; окружающая среда земли в позднем плейстоцене; геоархеология; археологическое изучение обсидиана; экология человека. Награда Японской ассоциации исследований четвертичного периода в 2011 году. Публикации включают более 30 статей на английском языке в рецензируемых журналах. Также опубликовал более 150 статей и отчетов о раскопках на японском и русском языках. Представил более 100 устных докладов, в том числе в качестве основного докладчика, в Японии, Соединенных Штатах, Канаде, Германии, России, Корее, Китае, Монголии и Вьетнаме. Buvit, I., Izuho, M., Terry, K., Shitaoka, Y., Soda, T., Kunikita, D. 2014 Late Pleistocene Geology and Paleolithic Archaeology of the Shimaki Site, Hokkaido, Japan. Geoarchaeology.doi 10.1002/gea.21474. Izuho, M., Hayashi, K., Nakazawa, Y., Soda, T., Oda, N., Yamahara, T., Kitazawa, M., and Buvit, I. 2014 Investigating the Eolian Context of the Last Glacial Maximum Occupation at Kawanishi-C, Hokkaido, Japan.Geoarchaeology.doi 10.1002/gea.21477. Ferguson, J. R., Glascock, M. D., Izuho, M., Mukai, M., Wada, K., Sato, H. 2014 Multi-Method Characterisation of Obsidian Source Compositional Groups in Hokkaido Island (JAPAN).Methodological Issues for Characterisation and Provenance Studies of Obsidian in Northeast Asia. Edited by Akira Ono, Michael D. Glascock, Yaroslav V. Kuzmin, YoshimitsuSuda. BAR International Series 2620. Archaeopress, Oxford. pp.13-32. Wada, K., Mukai, M., Sano, K., Izuho, M., and Sato, H. 2014 Chemical Composition of Obsidians in Hokkaido Island, Northern Japan: The Importance of Geological and Petrological Data for Source Studies. Methodological Issues for Characterisation and Provenance Studies of Obsidian in Northeast Asia. Edited by Akira Ono, Michael D. Glascock, Yaroslav V. Kuzmin, YoshimitsuSuda. BAR International Series 2620. Archaeopress, Oxford. pp.67-84. Kuzmin, Y. V., Glascock, M. D., Izuho, M. 2013 The Geochemistry of the Major Sources of Archaeological Obsidian on Hokkaido Island (Japan): Shirataki and Oketo. Archaeometry, 55: 355–369. 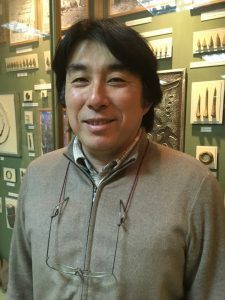 Izuho, M. 2013 Human Technological and Behavioral Adaptation to Landscape Changes around the Last Glacial Maximum in Japan: A Focus on Hokkaido. In K. E. Graf, C. V. Ketron, and M. R. Waters (eds.) Paleoamerican Odyssey. pp. 45-64. Texas A&M University Press.pp.45-64. Iwase, A., Hashizume, J., Izuho, M., Takahashi, K., and Sato, H. 2012 The Timing of Megafaunal Extinction in the late Late Pleistocene on the Japanese Archipelago.Quaternary International, 255:114–124. Ono, A., and Izuho, M., (eds.) 2012 Environmental Changes and Human Occupation in North and East Asia during OIS 3 and OIS 2. British Archaeological Report International Series, 2352. Archaeopress. Oxford. Попов, А., Изухо, М., Лазин, Б., Ямада, С., Морисаки, К., иСато, Х. 2012 АрхеологическиеИсследованиянаПамятникеГвоздево-5 вЮжномПриморье. Дальневосточно- СибирскиеДревности. Новосибирск. Takahashi, K., and Izuho, M. 2012 Formative History of Terrestrial Fauna of the Japanese Islands during the Plio-Pleistocene. In Ono, A. and Izuho, M. (eds) Environmental Changes and Human Occupation in North and East Asia during OIS 3 and OIS 2. British Archaeological Report International Series 2352. Oxford. Izuho, M., Akai, F., Nakazawa, Y., and Iwase, A. 2012 The Upper Paleolithic of Hokkaido: Current Evidence and Its Geochronological Framework. In Ono, A. and Izuho, M. (eds) Environmental Changes and Human Occupation in North and East Asia during OIS 3 and OIS 2. British Archaeological Report International Series 2352. Oxford. Sato, H., Izuho, M., and Morisaki, K. 2011 Human Cultures and Environmental Changes in the Pleistocene/Holocene Transition in the Japanese Archipelago. Quaternary International, 237:93-120. Nakazawa, Y., Iwase, A., Akai, F., and Izuho, M. 2011 Human responses to the Younger Dryas in Japan.Quaternary International, 242:416-433. Izuho, M., Tsogtbaatar, B., Yamaoka, T., Hayashi, K., and Enkhtur, A. 2010 Preliminary report of geoarchaeological investigation at Khanzat-1, eastern Mongolia Edited by Jan Bemmann, Hermann Parzinger, Ernst Pohl, DamdinsurenTseveendorzh. Current Archaeological Research in Mongolia.Bonn Contributions to Asian Archaeology, Vol.4.University of Bonn. Germany. pp.32-45. Izuho, M., and Hirose, W. 2010 A Review of Archaeological Obsidian Studies on Hokkaido Island (Japan). Crossing the Straits: Prehistoric Obsidian Source Exploitation in the Pacific Rim. BAR International Series, 2152. Oxford, UK, pp.9-25. Izuho, M., Nakazawa, Y., Akai, F., Soda, T., and Oda, H. 2009 GeoarchaeologicalInvestigations at theUpper Paleolithic Site of Kamihoronai-Moi, Hokkaido, Japan.Geoarchaeology, 24:492–517. Izuho, M. and Sato, H. (2007) Archaeological Obsidian Study in Hokkaido, Japan:Retrospect and Prospect. Indo-Pacific Prehistory Association Bulletin, 27.pp. 114-121. Izuho, M. and Tsogtbaatar, B. (2007) Khanzat-1: A Geoarchaeological Investigation in Eastern Mongolia.Current Research in the Pleistocene, 24:31-35. Nakazawa, Y.,Izuho, M., and Akai, F. (2007) The Late-Glacial Microblade Assemblage from the Kamihoronai-Moi Site in Hokkaido, Northern Japan: A Newly Discovered Yubetsu Method. Current Research in the Pleistocene, 24:37-40. Takahashi, K., Soeda, Y., Izuho, M., Yamada, G., Akamatsu, M., and Chang, C. (2006) The chronological record of the woolly mammoths (Mammuthusprimigenius) in Japan, and its temporary replacement by Palaeoloxodonnaumanni during MIS 3 in Hokkaido (northern Japan). Palaeogeography, Palaeoclimatology, Palaeoecology, 233: 1-10. Ono, A. and Izuho, M. (editors) (2006) Special Focus: News in the Paleolithic Archaeology of Japan. Current Research in the Pleistocene, 23: 1-40. Izuho, M. and Takahashi, K. (2005) Correlation of Paleolithic Industries and Paleoenvironmental Change in Hokkaido (Japan).Current Research in the Pleistocene, 22: 19-21. Nakazawa, Y., Izuho, M., Takakura, J. and Yamada, S. (2005) Toward an understanding of technological variability in Microblade assemblages in Hokkaido, Japan. Asian Perspectives， 44-2: 276-292. Takahashi, K., Soeda, Y., Izuho, M., Aoki, K., Yamada, G., and Akamatsu, M. (2004) A New Specimen ofPalaeoloxodonnaumanni from Hokkaido and its Significance.DaiyonkiKenkyu, 43-3: 169-180.